I do love those angle grinder gears. Cheap too five and a half quid for a pair, on ebay ! You really need to grind them to final size, used them in RC turbine helicopter gearbox's, and balanced them too. is your friend. Did you also notice that the full mesh is off centre. I do like your tapping head example, is that a project under construction, and will the drawings be available ? Do you have any measurements ? LOL as precision isn't one of the strong points you end up having to feel for the best mesh then devise a way to measure between centres. In my cases the fiddle factor was accomplished with shim washers to get the final mesh I wanted. 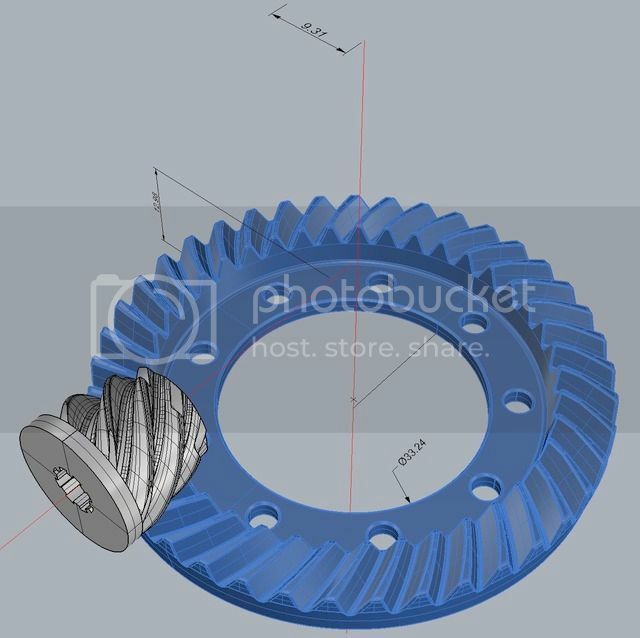 I like angle grinder gears so much I modelled them in 3D for printing and use in various projects as I can quickly scale them. You can see in the above example my offset is 9.31mm and approx 13mm above the base of the main gear. I would also include some form of thrust bearing or preload on the pinion as over time it tends to get drawn in or flung out and starts to clunk !!! At least you know its time to redo the bearing. See, I was so taken by your tapping head example I didn't even think about the offset mesh, suppose it might still work OK with partial mesh as you did with the unicycle. Post the results if you make one, would love to see it Bill. In the unicycle example the two crown wheels balance the lateral forces on the pinion (the pinions are positioned by head of the shoulder bolts) backlash is adjusted with shims on the crown gears.